I recently read that 5% of all cable TV subscribers had cut the cord. They were using services such as Netflix, Hulu, YouTube or Amazon Prime to watch their favorite TV shows. Typically using a tablet of smartphone to do this, it gets tricky to share the device when you watching it with another person. It also gets tiring to hold your device for the duration of an entire TV show or movie. Like your flat screen TV, what if you could mount the tablet to your living room or bedroom wall? In this article, we will show you how to mount a tablet to a wall. The mount in the photo with this article is the Arkon Heavy Duty Tablet Drill Base Mount for Wall or Counter. It’s a well made mount and installation is easy. You will need a screwdriver, perhaps a drill and some long screws. I recommend trying to attach this to a beam in your wall. Although the mount comes with some screws, I prefer to use longer ones. If you cannot find a beam, use some molly bolts as you do not want your tablet to fall off the wall. 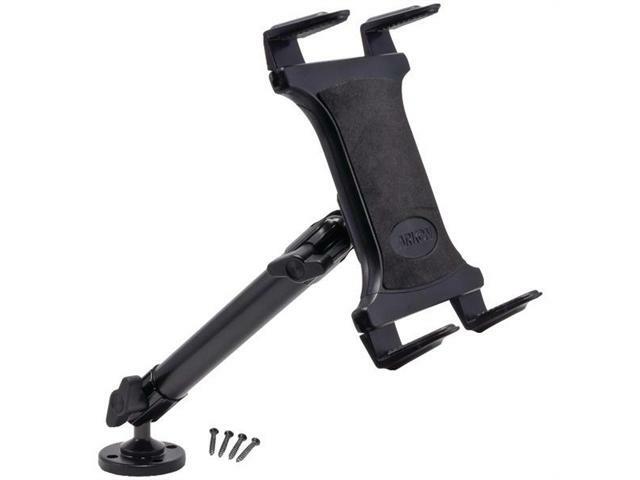 The advantage of this mount is a lower price and the universal cradle. As readers of our site know, we favor universal cradles over custom cradles because you will likely use a case or skin on your tablet plus the mount can be used again when you upgrade your tablet. There are swivel points at the base and cradle so you can turn the tablet to get the best angle. Insertion of the tablet into the spring loaded cradle is simple. The second option which I have used is from RAM Mounts. We have mentioned this company’s products in many other articles on this site. RAM makes a solid mount with a lifetime warranty. This solution will cost a bit more but is a bit more solid. You will need to purchase two components. First, you will need the metal base mount. I like to use the Ram Mount 1-Inch Diameter Ball Flat Surface Mount with Long Double Socket Arm which include an extra long 6-inch arm. You will need a screwdriver and perhaps a drill. The base has a series of screw holes drilled which will accept mounting screws. The screws are not included. I suggest finding a beam or use molly bolts as you want to ensure the mount and tablet do not fall off the wall. Second thing you will need is the cradle. For larger tablets, use RAM’s large tablet cradle kit which includes a series of supports that will fit most larger tablets such as the iPad or Galaxy Tab 10.1. If you have a smaller tablet such as an iPad Mini or Samsung Galaxy Tab 7, I prefer to use the RAM X-Grip IV cradle. We wrote a detailed article on this cradle series which you can read here. I have used both of these options over the years and they work real well. My experience is that smaller tablets are difficult to see more than a few feet away. If you would like to use your tablet to watch videos, movies, TV shows, go with the larger and supplement it with a Bluetooth speaker as you will have trouble hearing the volume from a far distance without an external source. By the way, this setup will also work real well for using a service such as Skype or Facetime to make video calls. You will just want to ensure your Bluetooth speaker has a microphone built in.